As the largest consumer cooperative company in the Netherlands, DELA funeral insurance aims to take care of those left behind. 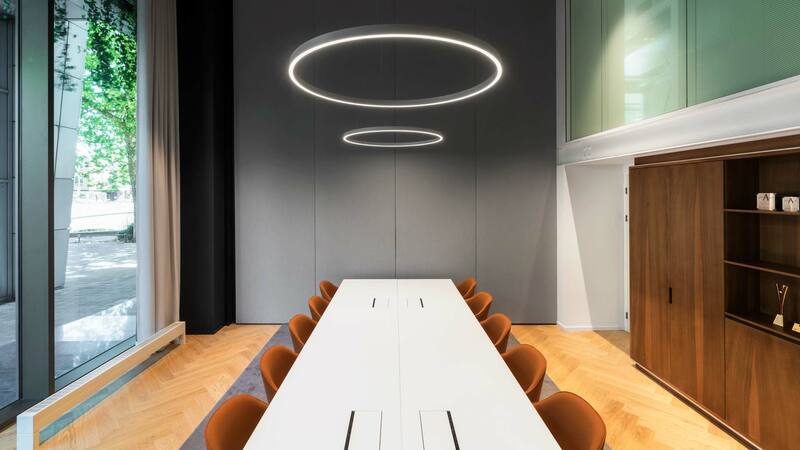 DELA have a strong, human centred approach towards its members and it is this attitude which flows through all aspects of the organization. 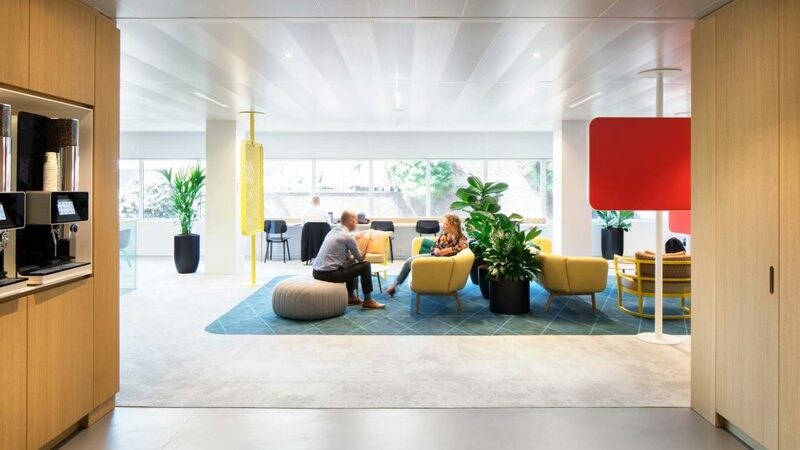 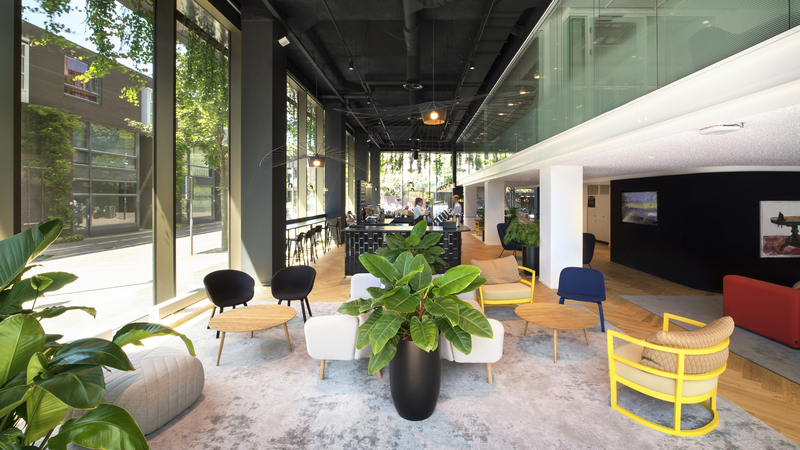 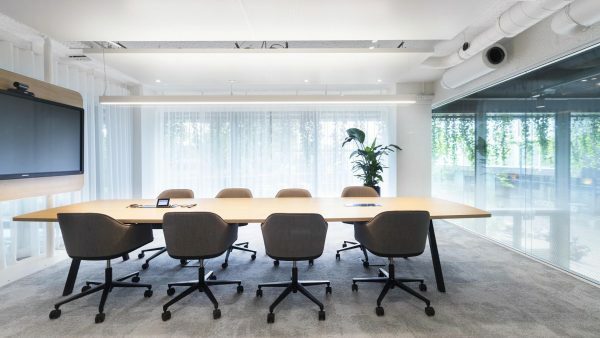 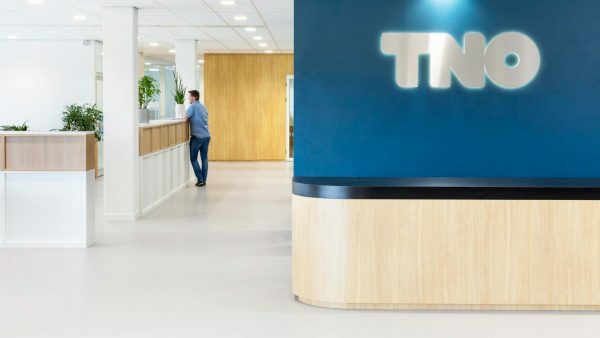 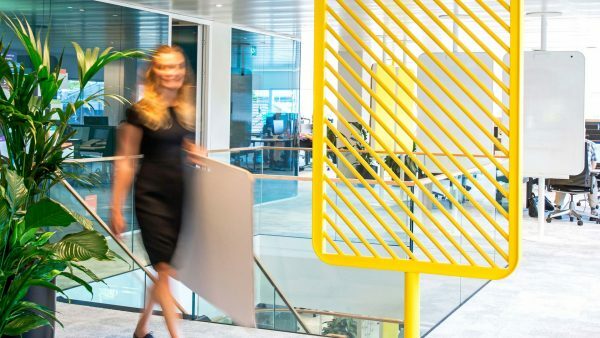 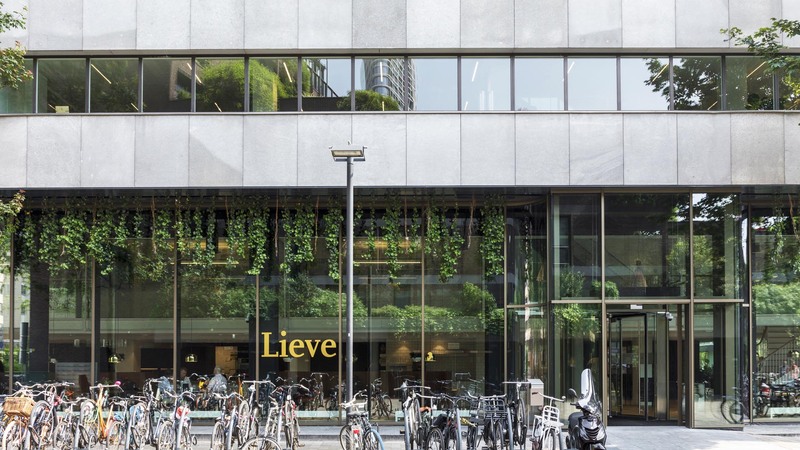 For the redevelopment of their 5800m2 Headquarters, Hollandse Nieuwe were asked to translate these core values across work-floors, a new restaurant and meeting centre. 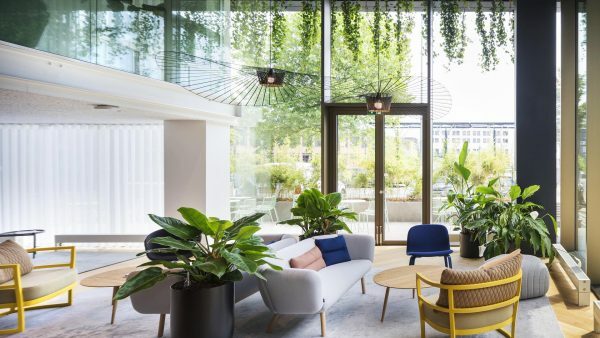 These new spaces reflect DELA’s ambitions by conveying an approachability and openness, creating human centred environments through a healthy and inspiring workplace. 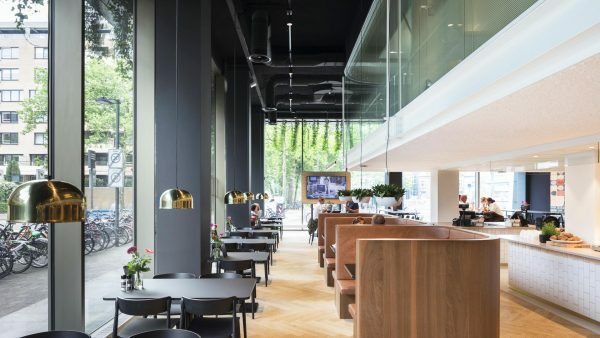 The entire ground floor has been transformed through a new double height glass façade, linking the plinth of the building to the outside world, bringing the city in. 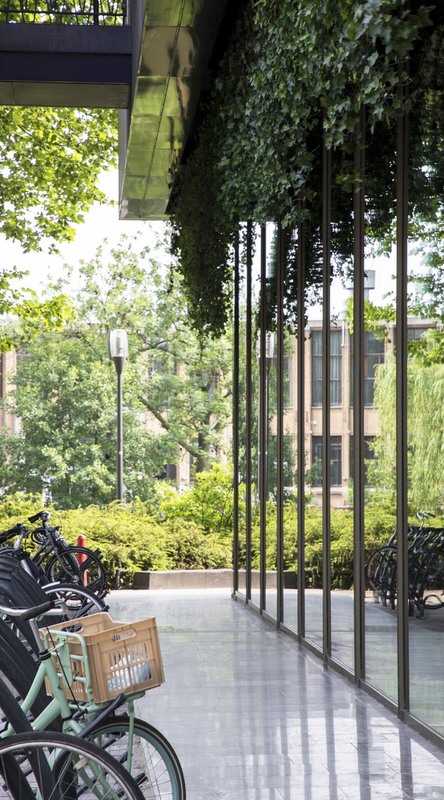 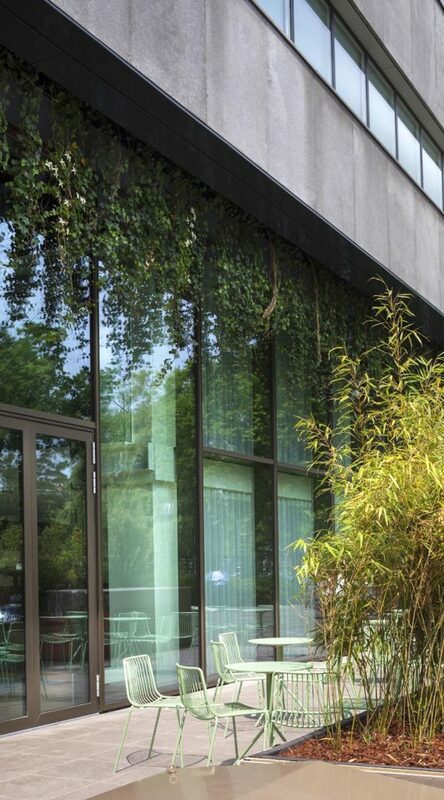 Looping around the building is the ‘Green Skirt’, a continuous layer of plants hanging down in front of the glass façade, helping to form a connection to the green surroundings. The ground floor space provides a rich and warm ambiance through its combination of natural oak floor, black ceramic espresso bar, dark upholstered walls, lush greenery and colour accents added through furniture. 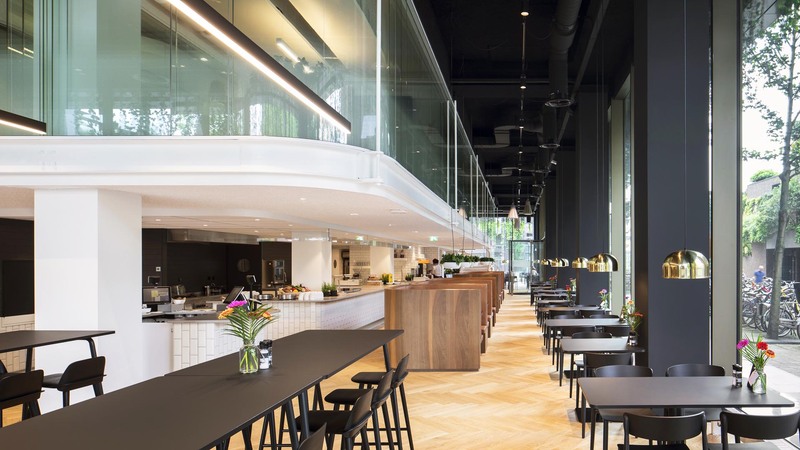 Contrasting this warm and strong space is the white, light filled mezzanine level overlooking the restaurant. 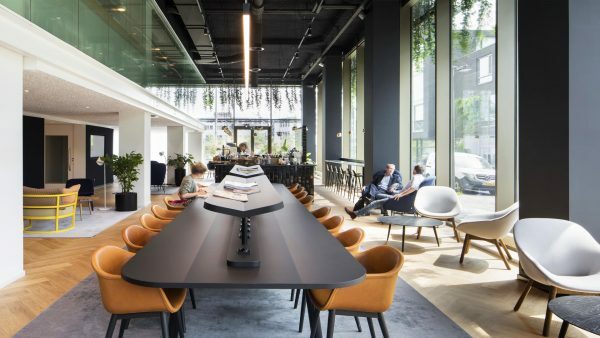 This level provides the perfect place for meetings and focused work. 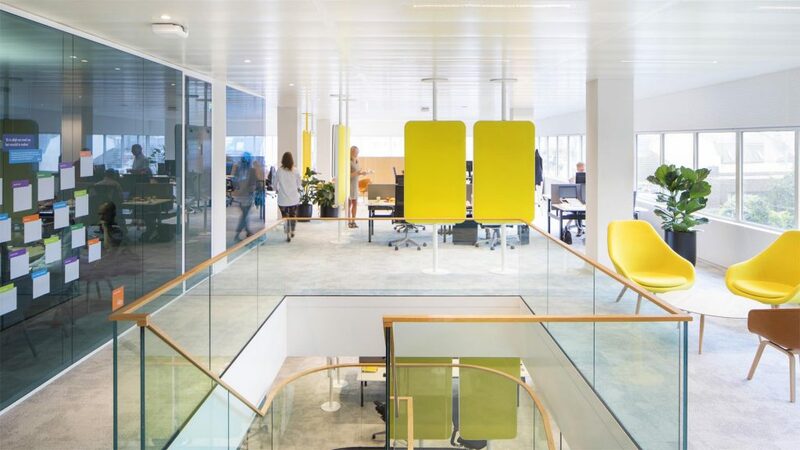 The design of the work-floors continues the attitude and atmosphere of the ground floor whilst facilitating DELA’s evolving work-processes. 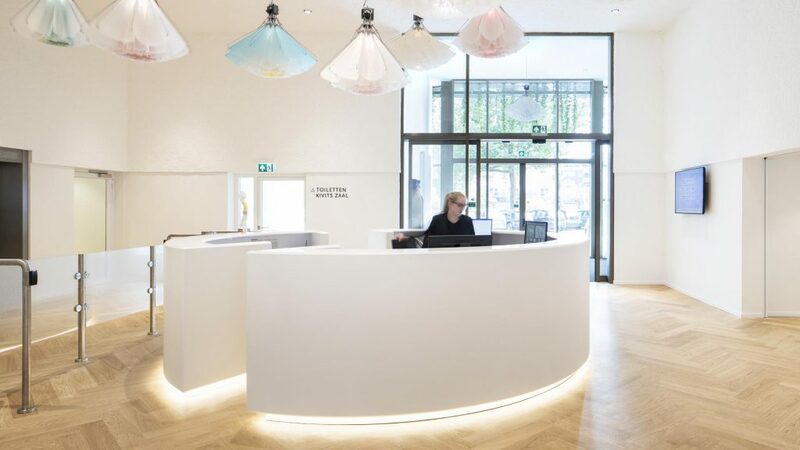 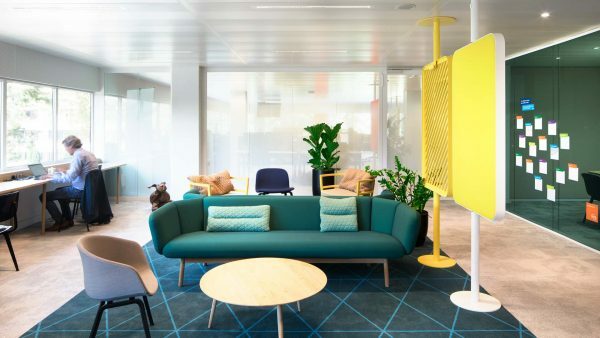 Specific material and colour choices clearly define work areas and the diverse range of flexible workplaces that cater to different work types. 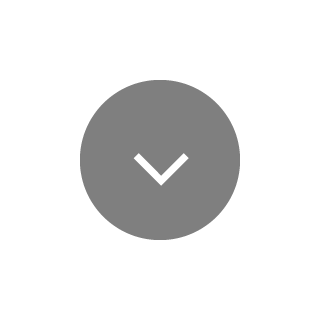 This makes each floor unique, with its own simple, clear and efficient workflow. 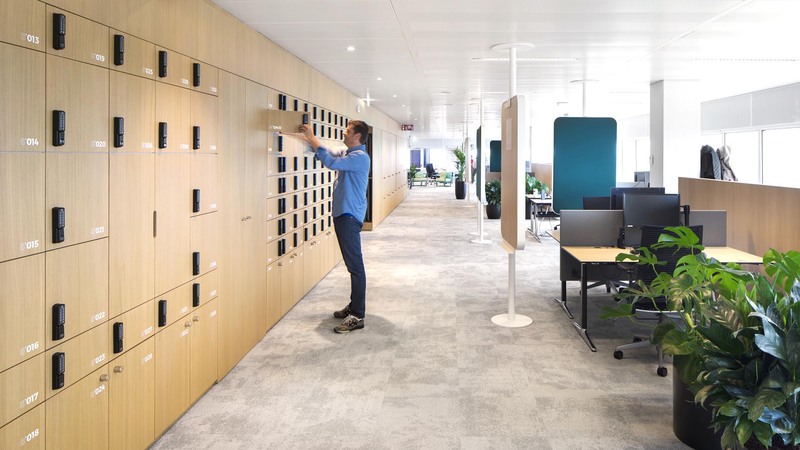 To help organize each floor, secondary functions and meeting spaces are located around the existing central core. 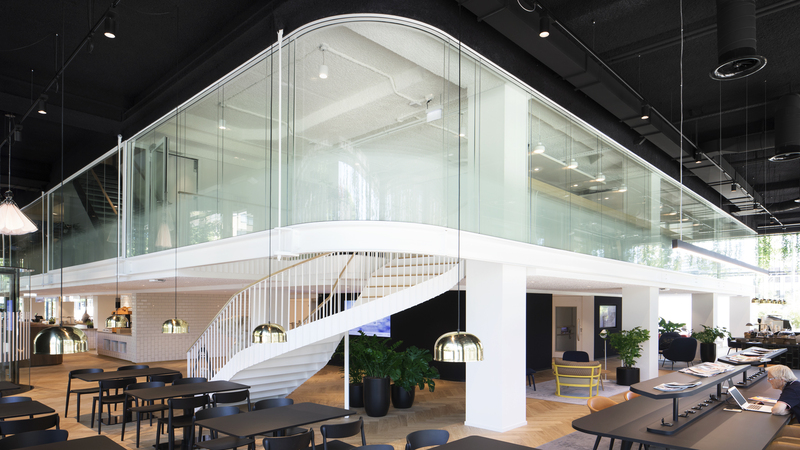 The resulting open floor plan maximizes the daylight and outside views for all employees. 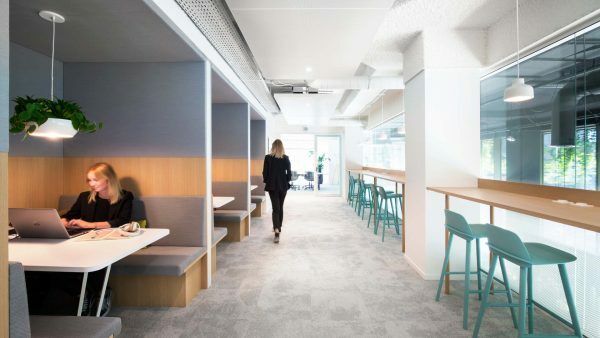 Agile and Scrum practices are optimized with a mobile system, PANL™, forming additional acoustic and visual divisions. 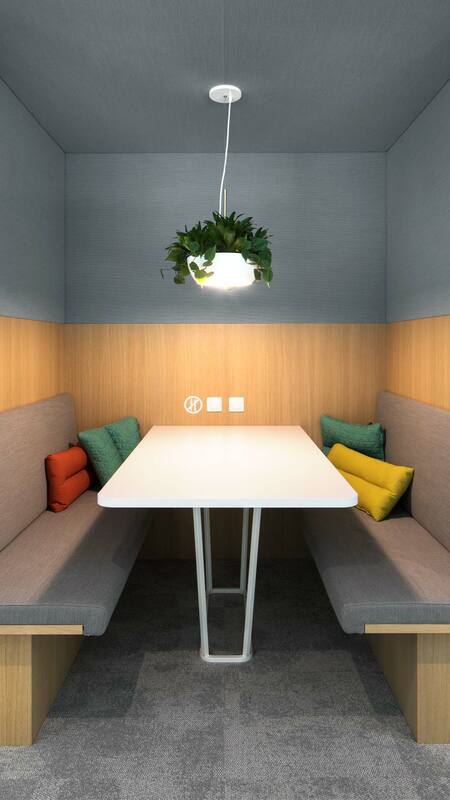 The PANL system allows a team’s environment to change with them, maximizing flexibility and activity-based working. 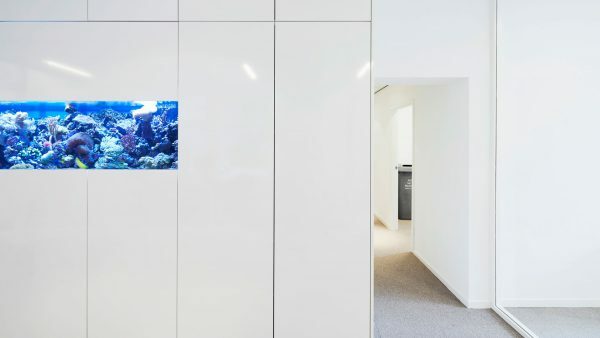 Focusing on qualities such as flexibility, movement, healthy and durable material finishes and internal greenery have all contributed to an inspiring and sustainable project, that has also earnt the building a BREEAM In Use certificate.